A trip to Florida can seem like a lot to take in if you have babies or young children with you. Theme parks, beaches, and attractions can be overwhelming. However, there are plenty of activities in Florida even the youngest family members can enjoy. A trip to the Walt Disney World Resort in Orlando is the go-to destination for many families. Toddlers will enjoy many of the rides, shows, and characters, especially in the Magic Kingdom. Navigating theme parks can be tiring, though. The good news is Disney is also a great experience outside the theme parks. If you are staying at the resort, you can hang out with the kids at the pool, many of which have slides and play features for all ages. Even a ride on the monorail and transportation boats is a treat for toddlers. Outside of Disney, there is plenty to do in Orlando. Nearby on International Drive, there are numerous attractions for kids of all ages. They include Monkey Joes, which is filled with bounce houses, some especially designed for toddlers. Fun Spot America has go-karts, thrill rides, and a Kid Spot designed for children from 24 to 42 inches tall. You may not realize how many lakes there are in the Orlando area, and one way to enjoy them is to take the Winter Park Scenic Boat tour. Afterward, everyone can find something to do or eat in downtown Winter Park, just a stroll away. Another popular destination is the Tampa Bay area, which includes Tampa and the beaches of St. Petersburg and Clearwater. Fort De Soto Park near St. Petersburg was named one of the top family beaches in the country. Lifeguards are on duty, and the North Beach area has a gradual slope and gentle waves to make it safer and more accessible for small children. In Tampa, you can visit Busch Gardens. In addition to thrill rides, you can see hundreds of animals and take a relaxing train journey around the park for the perfect end to an active day. Up north about 50 miles is Weeki Wachee Springs State Park. It includes a popular mermaid show that has been a staple of Florida tourism for 70 years. Kids can also see animals—including alligators and snakes—up close. In the Florida Panhandle area, Panama City offers a lot for the little ones. The state parks throughout Florida are a treasure, and St. Andrews State Park is among them. It includes a beach, and the jetty is perfect for the smallest kids. The water is clear and slopes gently. There is also a kiddie pool at the north end. Other family members may want to rent snorkeling gear at the concession stand and enjoy the many colorful fish farther from shore. Other kid-friendly activities in Panama City include cruises on pirate ships or watching dolphins. 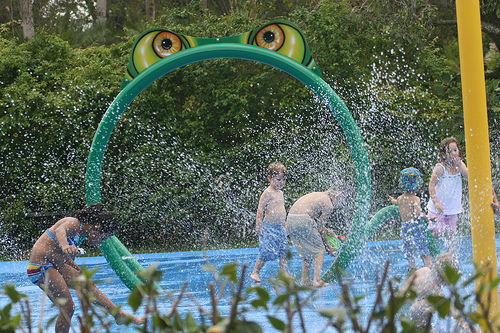 Frank Brown Park is free and includes a splash park, aquatic center, and children’s playground. Florida offers lots of entertainment, scenery, sun, and fun for the family. Just make sure to use plenty of sunscreen and put yourself in the place of the youngest ones to ensure everyone has an fun and relaxing vacation. You might just have a blast yourself.